Jacques Riviere knew how to accept art emotionally. No French critic was ever less a traditional pedagogue. Rivibre was an intelligent French writer, who knew that the summit of the intellect is to admit aff ective knowledge, instinct, and intuition. The "heart," or taste, is always superior to raw intelligence.Reviere's supple metaphors are not easily rendered into English. Th e density of his thought, the complexity of his views, the moral and spiritual fervor that vibrates in these pages, further enhances the difficulties the skilled translator must overcome. Literary criticism is often ephemeral; it has served its purpose if it stimulates discussion about the work of art under scrutiny. Not so with essays like these. Th ey demand an active reading, as do the original works themselves. Th ey do not easily yield their signifi cance.Among the critics who came into the French literary scene in the years immediately preceding and following the First World War, Jacques Riviere has been least affected by the attrition of time. 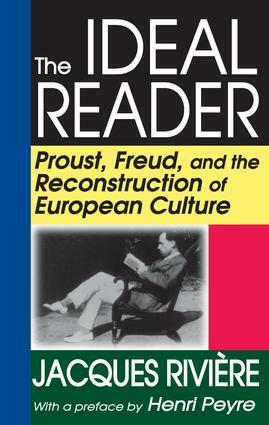 His studies of Proust and Rimbaud still rank among the two or three essential works to be read on these authors. Few other critics have gone further in a sensuous perception of these authors' work and the intellectual lucidity in analyzing it. Reviere had few pretensions to profundity and a great purity of style. In an age of slogans and judgments, this volume reminds the reader of the extraordinary role of European critical thought in the twentieth century.